Over the past year, student volunteers from over 35 universities have used GEMS (Green Energy Management System) to help small businesses identify energy efficiency opportunities and to raise awareness of the importance of sustainable business practices. The global, grassroots movement, Green Impact Campaign, developed GEMS as a free application available to small businesses to help them in pursuit of the goal of reducing their environmental impact on the planet. GEMS and the Green Impact Campaign was created as a fist step for small businesses to join the green movement even though they may lack the budget, resources, or knowledge and are so often overlooked for energy efficiency and sustainability outreach. Now, with the emergence of the Green Button, GEMS will become more than an energy auditing application; it can mature as a virtual energy manager for small businesses, capable of providing dynamic, real-time energy data and analysis throughout the course of energy efficiency improvements. The combined efforts of the Green Button initiative and Green Impact Campaign will bring energy education, insight and verification to small businesses across the nation. The GEMS application allows student volunteers to survey building systems using an easy to understand, self-training guide for small businesses in their community. Small business owners then access GEMS to receive detailed energy efficiency recommendations, benchmark building energy usage against national averages, and tracks cost savings as recommendations are implemented. The Green Impact Campaign has received great support from several organizations who believe that the GEMS application will be valuable in the pursuit of bringing together small businesses across the country in a collective sustainable movement. There may be unexpected results if multiple users are making changes or upload an other-than-annual XML data set. We have provided our renamed data set as a part of this submission, which is only a name modification of the Multi-family Mountain data. 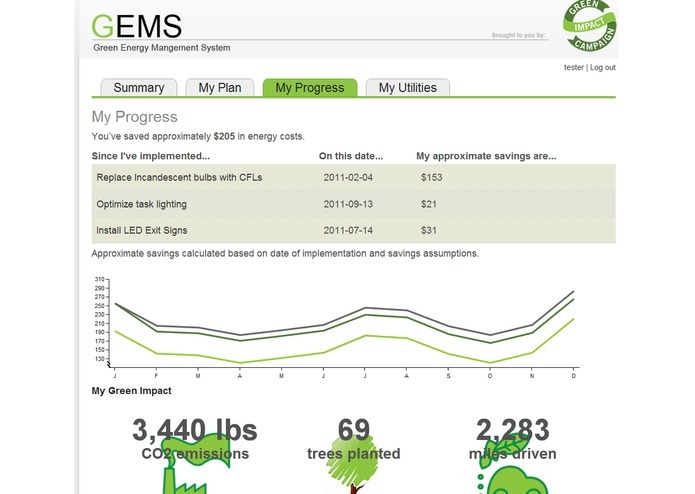 GEMS currently adjusts this data to make the energy use reflect more realistic energy consumption of a small office. Our current GEMS submission reflects the ongoing development of GEMS 2.0, which will continue for the next couple months. The GEMS 1.0 that is in production does not allow self-auditing/self-survey; however, the new GEMS 2.0 system will allow for self-auditing/self-survey and other additional user features.